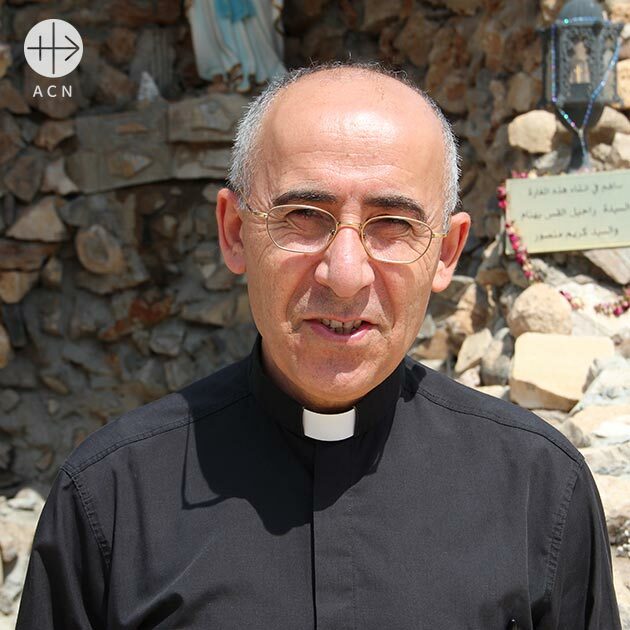 It is a great pleasure for me to address this message of thanks for what you have been doing for the Christians in the Nineveh plain, in Iraq. I am writing to you on behalf of tens of thousands of men, women, and children. ISIS has struck us with tragic violence. 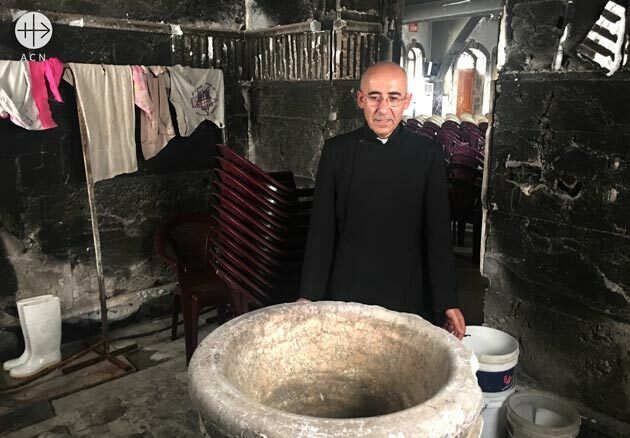 They have killed thousands of people and destroyed houses, schools, churches, convents and more in the attempt to erase the thousand-year-old Christian presence from the Nineveh Plain. It has been terrible for us but our strength lies in the undeniable faith in Christ. The Lord has helped us to carry the cross by giving us courage and hope. It has been only a few months now since we were able to get back. Slowly we are rebuilding homes, schools, churches and other religious buildings. It would be impossible to resume life here without having proper places to pray and praise God. The reconstruction of buildings and everything else is only possible thanks to you, benefactors of Aid to the Church in Need. ACN has been among the major responsible of a “Marshall Plan” for the reconstruction of what ISIS destroyed in the Nineveh Plain. Up to now, we have restored and rebuilt 2,242 houses, schools, churches and convents. We are aware that there is still a lot of work ahead. In fact, the next phase will be even harder because we will deal with the burnt houses. But with your support and prays we are sure that we are going to be able to complete the huge reconstruction work we have started. Many people in Ukraine are destitute, especially older people and families. The armed conflict taking place in the eastern part of the country also continues to claim victims. The Catholic church helps those in need by providing them with both pastoral and material aid. Three years ago, the Catholic faithful of the parish of Our Lady of Consolation in Lwawu were devastated when torrential rainfall completely destroyed the roof of their church. Their community, in Zambia‘s North-Western Province, not far from the frontier with Angola, simply did not have the money to repair the roof from their own resources. This is an underdeveloped and neglected region where there is widespread poverty. The people love the Church, and their own parish church is the heart of their community, but the cost of replacing the roof was simply too astronomically high for them to contemplate. Fortunately, and thanks to the generosity of our benefactors, we were able to come to the aid of the parish. Initially, we gave 4,400 Euros for the new roof and then, when that proved insufficient – since the steel roofing members had to be transported from miles away – we gave another 2,000 Euros. 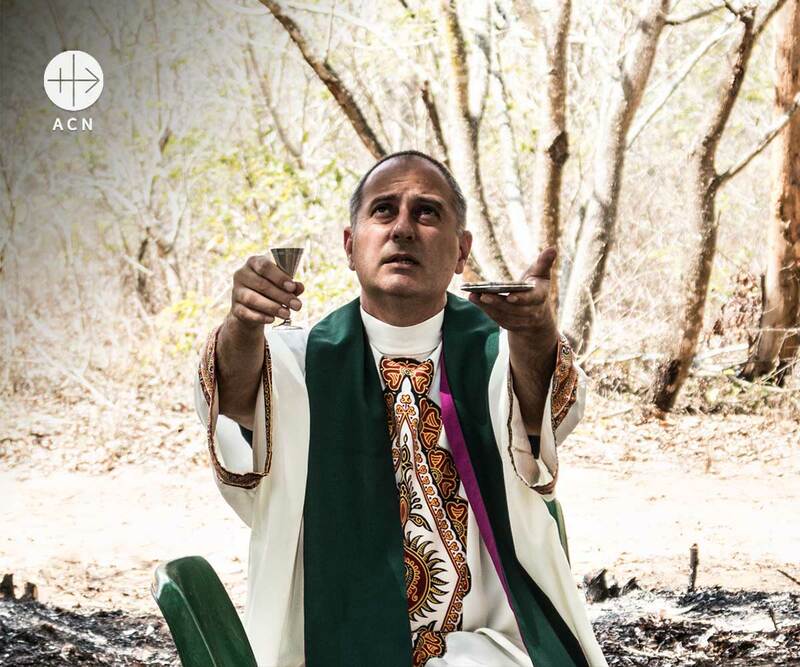 My name is Father Juan Gabriel, I’m Argentinian (diocese of Buenos Aires), currently a missionary in Mozambique, in the diocese of Xai Xai. I’m writing to thank you for the money of the intentions of the Mass sent to me by my Bishop, Dom Lucio Andrice Muandula. I am pastor of the Mangundze Mission. We have 42 communities, chapels. I am alone, as a priest, to attend to it. We are in a rural area. Some communities are more than 90 km away from the headquarters, my home. My wish is to stay in this diocese for good. I do not want to go back to Argentina. I tell you that I have a piece of paper in the sacristy, where I write down the masses I celebrate, to keep track. It is six months now since the bombs stopped falling on the city of Aleppo in Syria. Although in the distance, at night time, you can still hear explosions in some still disputed zones on the outskirts of this large city which, before the war, was home to over 2 million people. The precise number of inhabitants at the present time is difficult to know with any certainty, since many people have fled to other parts of the country and others have even emigrated abroad, to nearby countries like Turkey, Lebanon, Jordan, or still further afield to Europe and America. For those who remain this will be the first summer since 2012 they will be able to spend in peace and even enjoy an occasional moment of rest outside the city. For this reason, the Syrian-Catholic Archbishopric of Aleppo has organized summer camps for them in the so-called Valley of the Christians, near Homs. The international Catholic pastoral charity and pontifical foundation Aid to the Church in Need (ACN) is now stepping in to help, with a summer camp and a contribution of 30,000 Euros. Among the beneficiaries are some 1200 children, young people and adults belonging to the Syriac Catholic parish of Saint Ephrem in the Old Syriac Quarter, a parish founded by survivors of the great Armenian genocide in 1915, Catholics from Turkey but of Syriac origin. But Father George Sabounji, the parish priest of Saint Ephrem’s parish states: “Our summer camp will include not only Syriac Catholics but also young people from the Orthodox and Greek Melkite communities. We are organising this project so that the young people can feel they are being accompanied and cared for and gain first-hand experience of God’s love for them and a sense of the communion that exists within the Church. And also so that they can have the opportunity to meet and communicate with other young people and not feel alone”. This middle-aged priest has a seemingly inexhaustible energy. He is the only priest in charge of this community and also provides food, medicines and lodging for hundreds of families who have been left homeless by the war in Aleppo. For even though the fighting has stopped now, many people are still unable to return to their homes on account of all the destruction. “This is more than a church, it is our home”, is the cheerful comment from Magdalene, a young mother who acts as our interpreter and who is also helping Father George to organise the summer camps. The ages of the young people involved in the summer camp range from six, the age when they make their First Holy Communion, up to 18 years. There will also be a group of adult helpers, in addition to the family groups. For Amanda, aged eight, this will be the first time she has ever been anywhere except Aleppo. “I’d like to go to Kafroun, and see the Wadi Al-Nasara (the Valley of the Christians)”, she says excitedly. The area where the summer camp will be held is renowned as one of the prettiest regions in Syria, a fertile region close to the frontier with Lebanon, in a majority Christian area. “What I like most about the summer camps is that we will be able to grow deeper in prayer and in faith. And also, we will get to know new friends. Your generosity is helping us to understand that we are not alone”, adds Miriam, aged 15, who is a member of the Confirmation group in the parish of Saint Efrem.